Various forms of sexual abuse are common in detention facilities around the world. Research studies, reports by independent bodies such as the Jali Commission of Inquiry and the Judicial Inspectorate of Correctional Services (JICS), and documented reports by victimised inmates make clear that South Africa’s detention facilities are no exception. 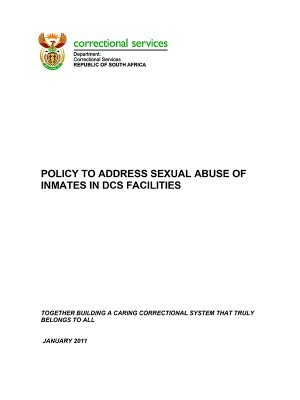 The Department of Correctional Services (DCS) is working in partnership with key stakeholders to address the problem. It is well known that sexual violence takes place in our correctional facilities, but it is often seen as part of normal prison life. Historically, DCS has remained silent or succumbed to a sense of powerlessness in the face of such an uncomfortable issue. DCS has also failed to share information about sexual abuse in our facilities and to ensure that all DCS staff receives the necessary training and guidance on how to prevent and respond to sexual violence. Sexual abuse in correctional facilities can no longer be tolerated or overlooked; now is the time for change.